The illegal use of clenbuterol in porcine feed in China has led to an overhaul in Chinese food industry regulations and calls for scientists to develop more stringent testing techniques for the chemical. Clenbuterol is a beta-2 agonist and sympathomimetic amine that is used to treat breathing disorders. When fed to livestock it accelerates growth and increases the proportion of lean meat. China began to use clenbuterol in pig feed in the late 1980s, but hundreds of people suffered from nausea, dizziness, hypertension and hyperglycemia after eating pork containing the chemical, and it was banned in 2002. According to Wang Zongli, from the Chinese Ministry of Agriculture, illegal use of clenbuterol is reducing year by year, but it has not been eliminated yet. 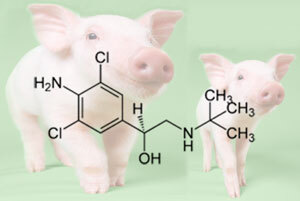 On 15 March, China central television (CCTV) reported that pork sold by Shuanghui, the country's largest meat producer, contained clenbuterol, sparking a nationwide campaign against the chemical's illegal use. By 8 April, a total of 95 people in central Henan Province, where Shuanghui is based, were taken into police custody for allegedly producing, selling or using clenbuterol. All meat product sales of Shuanghui have been suspended and the company has claimed total losses of up to Yuan20 billion (£1.9 billion). The scandal was caused by farmers pursuing profits and slack regulations, says Chen Wen, deputy dean of the School of Public Health of Guangzhou-based Sun Yat-sen University. According to Wang Zhixiang, a professor of veterinary science at Henan Agricultural University, random testing for clenbuterol by meat producers is carried out in the industry using a paper test and then positive results are confirmed with techniques such as gas chromatography mass spectrometry (GC-MS) and high performance liquid chromatography (HPLC). But the cost to test one pig is about Yuan30 while a meat producer's profit per pig is commonly only Yuan50, said Shuanghui's chairman Wang Long, when speaking to the Xinhua News Agency. As a result, the self random testing rate of meat producers is only 0.4 per cent while it is required to be 4 to 5 per cent of all pigs. 'If we want to eliminate the scandals, besides regulatory improvement, it is an urgent need to develop easier, cheaper, more convenient and wider-spectrum testing methods for regular food products,' Chen told Chemistry World.